Saddam Hussein had a lot of enemies but only one in particular captured Nostradamus’ obsession. Le noir l’ireux le sera repentir. He will be unable to protect himself by sea. The black one will make the angry one repent of it. The man between “two rivers” is the Iraqi dictator Saddam Hussein hemmed in between the Tigris and the Euphrates in Iraq. The phrase entre deux fleuues says as much. It hints to the name Mesopotamia (Iraq). The phrase “between two rivers” alludes to the Greek mesos (middle or between) potamos (river). Why him rather than some other fellow? Because Saddam Hussein is the only Mesopotamian leader in history who had needed to fear a military hand coming from the sea, the Persian Gulf. That military hand belongs to a creature Nostradamus cryptically calls “bloody Alus.” People have been wrestling to find deep and abstract meaning behind this enigma since 1556. A simple solution might have been overlooked. A Frenchman trying to describe a future acronym of a country, not as his future countrymen would call it but the way its own citizens would proclaim it. Hence, the “l” becomes the abbreviated French le (the); in this way, “a-l-u-s” becomes an anagram for “l’USA” (the USA). Nostradamus qualifies it as sanguinaire (bloody). Saddam Hussein was powerless to prevent an attack from the sea. It came through cruise missiles and carrier strike forces in both the Gulf War (1991) and Operation Iraqi Freedom (2003). It must be remembered that in the first war Saddam Hussein was so concerned about his coastal flank in Kuwait that he moved a number of divisions along the sea beaches to defend against signs of a gathering US amphibious invasion. It was never more than a ruse schemed up by the commander of allied forces, General H Norman Schwarzkopf, to pull Iraqi troops off their positions along manmade sand berms on the Saudi-Kuwaiti border from where the actual landward attack would come. Later Nostradamus’ bloody USA launched a second ground invasion force shipped into the Gulf and based in Kuwait in 2003, covered by two Carrier Strike Groups. The armored military hand or power to be feared lets fly two lightning fast armored pincers of US Army and Marine units bearing down on Baghdad alongside the Tigris and Euphrates. They rapidly took out the Baathist regime in six weeks. Saddam Hussein, their dictator, is that Angry One, displayed before the world, standing in the dock under guard, huffing and puffing in frequent and public rages before a revolving relay of new judges at his criminal trial. He was a Sunni Muslim prisoner hemmed in by police guards devoted to what Nostradamus called the Black One. That dark Ayatollah would make Saddam Hussein repent. I predict he will make all Sunnis in Iraq repent because through the Bloody USA this black and Saturnian young cleric and rabble-rouser’s hand had been set free. The USA destroyed the dictatorship that repressed it. It is mostly his people, the Shia majority population in Iraq, that in the first days of “freedom” by a US gun gathered in mobs aided by US Abrams tanks and cranes that battered down the idols of Saddam Hussein’s oppressive regime which had harmed them the most. The USA had un-gagged and liberated the black robed, dark eyed Ayatollah Muqtada al-Sadr to preach the imminent return of the Mahdi. He, who is the twelfth and final Imam of Islamic apocalyptic prophecy. He, who will lead cleric Muqtada’s “Mahdi Militia” on a march to Jerusalem and herald Judgment Day for all Muslim apostates (the Sunnis), Jews and the Christian “Crusaders” who now occupy Iraq. It was not the USA’s intent to give cleric Muqtada the right to form a 10,000-man militia and set up the holy bully pulpit of the loudest voice of Islamic eschatology in Iraq. Neither did the USA want future history, as seen by Nostradamus, to mark and qualify that nation for posterity with the future’s blood-soaked brush. Yet, here we are, in that future. The USA has left a long and bloodstained legacy in “Mesopotamia” (Iraq) starting with aiding and abetting Saddam Hussein’s tyranny over his own people and neighbors in the region during the Iran-Iraq War (1980–1988). The Iraqi invasion pushed back across the border in the first year of the eight-year conflict settled into a gruesome stalemate of trench warfare along a defense line drawn through marshland and deserts across the heartland of Mesopotamia (the Basra region). Starting around 1983, the US satellite intelligence cameras exposed the buildup of each new Iranian human wave offensive. American spies secretly beamed that intelligence to Saddam Hussein and shipped materials and know how to Iraqi weapons manufacturers so they could make chemical weapons that gassed waves of charging Iranian soldiers by the hundreds of thousands. By war’s inconclusive end, southern Mesopotamia was a desolate graveyard for nearly a million Iranians and Iraqis. Next came the Gulf War in 1991. Estimates calculate between 30,000 to 150,000 Iraqi’s died in the US led coalition air attacks across Kuwait and Iraq. Another half-million children in the next decade would die from water born diseases because of US-Coalition bomb damage to Mesopotamia’s water purifying systems. The next ensanguined episode came shortly after the Gulf War ended. President George H. W. Bush in an unconsciously off-handed public statement, inspired a Shia and Kurdish insurrection against Saddam Hussein. They had believed Bush Sr. promised US support if they would only rise up. They did. No US support came and Saddam’s surviving armies crushed the rebellion with over 350,000 Kurds and Shias butchered. We catch up now to the most recent bleeding USA adventure in Mesopotamia. It is estimated that Operation Iraqi Freedom in 2003 and subsequent years of insurrection and the sectarian violence it unleashed has been responsible for the deaths of upwards to 600,000 Iraqis. The butcher’s bill for Alus Sanguinaire so far is around 1.6 million Mesopotamian Arabs, Kurds and Iranians. All of this mess and mayhem the “bloody” bungling “Alus” has hatched out on Iraq in the name of non-existent weapons of mass destruction and now a non-existent stable democracy. It has empowered all Black Ones of radical Shia cloth. The Ayatollahs of Iran and Iraq now have, thanks to the USA’s “bloody” experiment in Iraqi democracy political power and influence. Firebrands like cleric Muqtada al-Sadr have won seats in the Iraqi Parliament to foment and establish what will soon become an anti-USA pro-radical Islamic, Iranian-style theocracy out of what is left of Iraq. 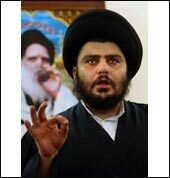 Is the dark eyed and black bearded rabble-rouser, Muqtada al-Sadr, Nostradamus’ “black one”? There is a clear and present danger this rebellion will spread beyond al-Sadr’s small movement and ignite an insurrection across two thirds of Iraq, among the Iraqi Shias. And yet, it may well turn out that the al-Sadr rebellion in itself will be impotent unless the US forces gathering their tanks around Najaf should use heavy handed tactics to seize al-Sadr hiding inside the holy city of all Shia factions. Even if the US occupiers show restraint in the 11th hour, there may yet be a terrible rebellion brewing, beyond their worst nightmares. It could come from a command or a statement of displeasure from Sistani if he thinks the US forces aren’t pulling out of Iraq fast enough after 30 June . April 2004 remains so far the second most lethal month of the Iraq occupation for US-Coalition with 140 dead, 1,214 wounded. Most fell in the first battle of Fallujah and street skirmishes against al-Sadr’s Mahdi militia in Najaf. The US Viceroy Paul Bremer’s negotiations with the peaceful and influential Ayatollah Ali Sistani helped cool the hotheaded al-Sadr down and forestalled a wider insurrection. The forces of “Bloody Alus” a few days before 30 June 2004 began their Texas two-step dance to Iraqi democracy handing over sovereignty to an interim government by Prime Minister Ayad Allawi. Next, the US guns guarded Iraqi polling places in a national election on 30 January 2005. Eight million people voted for a Transitional National Assembly. The Shia United Alliance won a majority of the assembly seats, the Kurd parties second. The rare Sunni candidates dodging car bombings and abduction came in a distant last place. A third of Iraq’s population had mostly boycotted the elections out of fear of reprisal or out of open hatred of the political scheme imposed by US occupiers stripping Sunni Iraqis of their centuries-long political overlording of Iraq. The second national election was held on 15 December 2005 for the first full-term government and parliament in the post-Saddam “democratic” era. The Shia-led United Iraqi Alliance once again emerged the winner of the most parliamentary seats, however they did not win an absolute majority to the unforeseen profit of Muqtada al-Sadr. He ran for office and at present holds an influential swing block of 30 seats. Without al-Sadr’s representatives, there would be no Shia dominated coalition government. He has become prime minister maker or breaker. Although he publicly puts up a front as an Iraqi nationalist, he is not adverse to taking money, training and imported arms for his Mahdi militiamen from Ayatollahs across the border in Iran. He is their political pit bull in Iraq–Sunni insurgents, al-Qaeda bombers, Kurdish Peshmerga militias and US Crusaders, be warned. An all-out fight with him is a surrogate war with Iran. Muqtada al-Sadr is back from Iran. Great throngs in what was the largest demonstration since 2003, pressed through the streets waving a sea of fluttering Iraqi flags, rather than the black with green Shia banners of previous assemblies. It is presumed that Muqtada al-Sadr on this the fourth anniversary of the fall of Baghdad desired to promote his pretense of being an Iraqi nationalist rebel, rather than a Shi’ite sectarian bully. A small band of Sunnis came along for the Shia “tide” and hundreds of Iraqi police and soldiers in uniform marched hand in hand with Mahdi militia waving the Iraqi flag. It was definitely a panoramic display of “Yankee infidel go home.” Only supporters of Grand Ayatollah Ali Sistani, still the most powerful cleric in Iraq, can produce such large-scale demonstrations. The concern I mentioned back in April 2004 about Grand Ayatollah Ali Sistani growing impatient with US forces leaving Iraq was unfounded. Often the empirical fulfillment of prophecies take a longer time than subjectively forecasted. What I said nearly three years ago in early April 2004 could stand as a prediction written for the near future beyond April 2007: a Shia insurrection in Iraq that plays like a domino effect spreading radical Islamic insurrections across the region. The 09 April demonstrations flagellated the shoulder of Shia clerical hierarchy in Iraq with the stinging reality that Muqtada al-Sadr is a force to be reckoned with. I wonder if in the future, even Sistani must bow to the deep fires and defiance of al-Sadr’s ever more popular movement. [Ayatollah] Khomeini’s revolution is still alive and waiting. It could topple a new [Iraqi] government and break up post-Saddam Iraq, and it could happen and very soon. An Islamic fundamentalist party rules Turkey at this moment. For now they pledge to respect and uphold the secular Turkish constitution. What will happen in Turkey if Iraq falls into chaos, the Iraqi Kurds declare their independence, and the eastern third of Turkey, populated by Kurds fights to secede from Turkey? …The line, “his power finally through bloody Alus,” could point to the power a black robed Ayatollah extremist has rekindled to incite a Shiite rebellion against a draconian occupying force Nostradamus calls “bloody Alus.” A rudimentary use of the laws of anagram easily transforms the riddle “Alus” into “l’usa” (or, “the USA” in English)! One can also drop the “u” in “Alus” and replace it with an “i” to imply (Ali S)istani. In that case “his power” stands for al-Sadr’s “power” to incite rebellion beyond his own small movement infecting Sistani’s followers “through” a union with the “bloody Ali” Sistani. Taking this farther, perhaps Nostradamus qualifies “Alus” as “bloody” because he saw visions of Shia men in these parades of devotion ritually slicing their foreheads and thus bathing their heads and shoulders in blood; or, he saw them flogging their backs to a “bloody” mess while they celebrated the martyrdom of their founder, Ali (“Alus”). The “black one” should fear the military hand of the Bush administration. Iraq will suffer a bloodbath–one that line four implies. One that even a “black” robed Ayatollah as moderate as Grand Ayatollah Sistani might unleash if he challenges the “angry one”–a frustrated President Bush–to “repent” his escalating military violence by ordering a general strike and rebellion of 15 million Iraqi Shias. This entry was posted in War in Iraq and tagged al-Hawza, Al-Jazeera, Alus sanguinaire, ANgry One, antichrist, Ayatollah Khomeini, Ayatollah Muhammad Sadiq al-Sadr, Baathist, Baathist regime, Baghdad, battle of Falluja, battle of Najaf, bloody Alus, Bush, Death to America, fait a compli, Fallujah, G.W. Bush, George Bush, Grand Ayatollah Allah Ali al-Sistani, Gulf War, Iran-Iraq War, Kurds, Kuwait, l'USA, Mabus, Mahdi militia, Mesopotamia (Iraq), Najaf, Nostradamus, Operation Iraqi Freedom, prediction, predictions, prophecy, Saddam Hussein, Shia United Alliance, Third Antichrist, Tigris and the Euphrates, Transitional National Assembly. Bookmark the permalink. Post a comment or leave a trackback: Trackback URL.